Oh my goodness. I forgot to photograph my red and green Christmas card today. Sorry, I had to take a few photo real quick, and edit. I'm super proud of myself for creating a red and green card. I don't typically make holiday cards with these colors. Not that they aren't pretty. It's just not my comfort zone, and so it takes a bit of time. The pattern paper is from Yellow Bicycle. And probably about 2 years old. So, I don't know if you can still find this pattern paper at your local scrap book store. The tree was purchased from a big box craft store about 3years ago. The red ribbon is actually new! Its the current real red ribbon from Stampin' Up!. The sentiment is heat embossed in early espresso powder by Stampin' Up!. 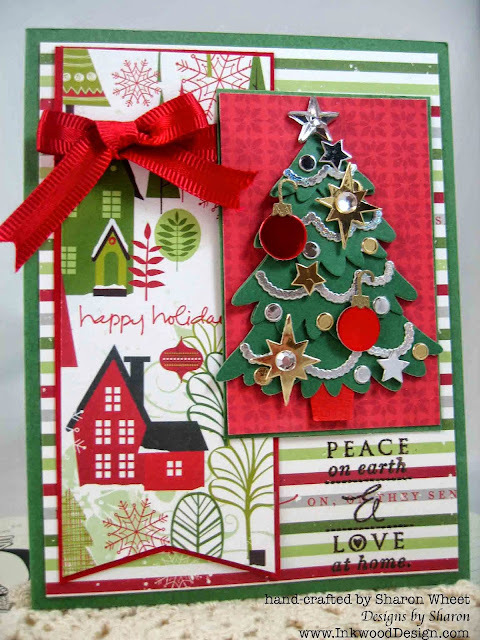 The stamp set used is Love Lives Here Holiday, by Paper Trey Ink. Thank you for stopping by! I am finishing a few more items for the craft fair tomorrow. If you are in the area (Albuquerque, New Mexico) please stop by Tramway Community Church on Manitoba & Montgomery, from 10a to 4p.